US State Department American joins in the search for the missing San Francisco couple in Peru. Jamie Neal and her boyfriend Garrett Hand departed the United States in December for an biking adventure through South America. Their biking expedition was to take them through Argentina, Chile and Peru, as the couple chronicled their travels on Facebook. However, the two were last heard from on January 25, 2013. Jamie’s last communication with her sister Jennifer was on the 25th , in a Facebook post. Jamie Neal had posted numerous pictures along the way during the couples trip; however, they have suddenly stopped. Another alarming set of events is that Garrett’s cell phone simply goes to a recording. KTVU reports, that the couple was last seen on January 26 taking a bus from Cusco to Lima and then getting in a cab. What is most amazing is the following from the KTVU article, “Although miles away from home, they were never more than a computer away from family and friends.” If that is what these two Americans thought or anything, past, present and future, you are delusional. Trust me from experience, when you are on such a vacation, you are all alone, by yourself. All the internet or cell phone does is chronicle your demise and potential last place you were at because by the time help comes, it is most likely going to be far too late. Cycle enthusiasts Garrett Hand and Jamie Neal left the Bay Area in November for an adventure of a lifetime, a bike trek through South America. Although miles away from home, they were never more than a computer away from family and friends. 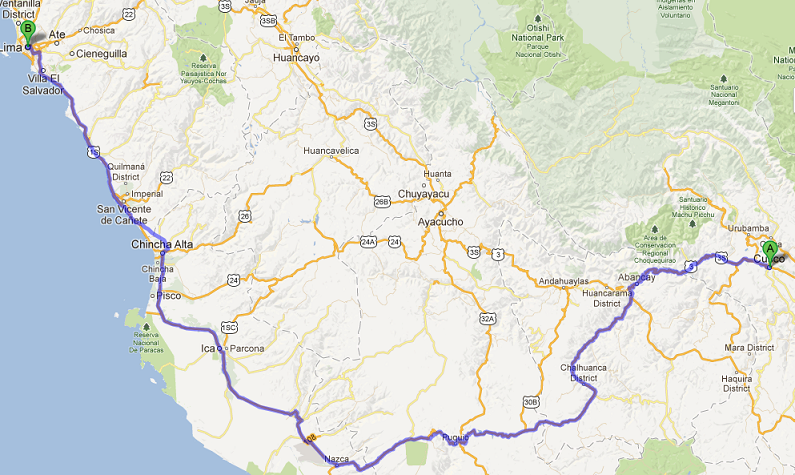 The couple chronicled their travels on Facebook, but the photos and status updates stopped Jan. 25. “It’s upsetting, I’m worried about both of them,” said Jeff Jerge, owner of Pedaler Bike Shop. FACEBOOK: American Citizen Services – U.S. Embassy Lima, Peru. The U.S. State Department has made a poster of Neal and Hand, while the U.S. Embassy in Peru’s website posted a travel warning for Americans. February 13, 2013 The U.S. Embassy warns U.S. citizens of a potential kidnapping threat in the Cusco area. The Embassy has received information that members of a criminal organization may be planning to kidnap U.S. citizen tourists in the Cusco and Machu Picchu area. Possible targets and methods are not known and the threat is credible at least through the end of February 2013. For the moment, personal travel by U.S. Embassy personnel to the Cusco region, including Machu Picchu, has been prohibited and official travel is severely restricted as a result of this threat. For more updates, to provide your opinion and analysis, and to read others opinions on this missing persons case, go to Scared Monkeys Missing Persons Forum: Jamie Neal and Garrett Hand. A U.S. Embassy warning to U.S. tourists of a potential kidnapping threat in the Cuzco region, including the famed Inca citadel of Machu Picchu, drew vehement objections from Peruvian officials Friday. But a U.S. Embassy official said credible evidence exists of a threat from a Peruvian terrorist group. The official confirmed a report in the Peruvian newspaper La Republica that said leaders of the cocaine-financed Shining Path outlaw band discussed kidnapping foreigners, principally Americans, in intercepted communications. Tens of thousands of Americans visit Peru each year. 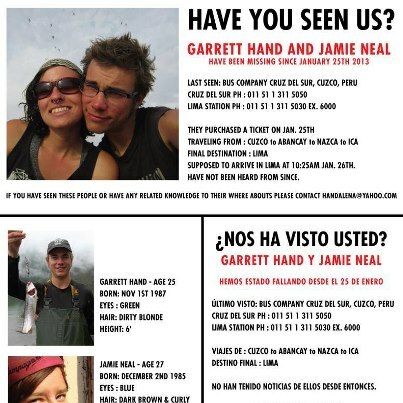 UPDATE II: Jamie Neal and Garrett Hand Found Safe. Jamie Neal and Garrett Hand have been found save traveling along the Navos River. They stated that they did not even know their families were looking for them. First let me state, I am glad they have been found safe and there was never any incident. That being said, are you serious! They kept in contact while traveling alone throughout South America on their biking trip constantly posting on Facebook, then go silent and out of contact for a month and they don’t think anyone is concerned or worried? REALLY? How would one not think that people are concerned that they have not heard from you in a month? This speaks volumes, doesn’t it. A California couple thought to be missing for a month during a trip to Peru have been located aboard a boat – and they didn’t even know their families had been looking for them. Jamie Neal, 25, and Garrett Hand, 27, from California’s Bay Area, left for Peru in December for a South America bike trip, and had not been in contact with friends and relatives since late January. The couple was found on a boat that was traveling along the Navos River.